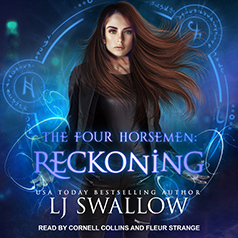 LJ Swallow presents the seventh book in the Four Horsemen series. Contains mature themes. Now the shocking truth about Vee's identity is revealed, the five are forced from to leave the UK in pursuit of the god threatening to end the world. But Chaos hasn't finished his games yet. The countdown is on to stop the portals opening and to discover his whereabouts. The arrival of new allies sends shockwaves through the group when they discover Joss's theories are true. But with them comes new hope. And following one more stunning twist about Vee's identity, and her connection to them, the five discover their place in the world is much bigger than they realised.